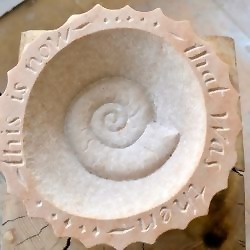 I am a stone carver and letter-cutter working to commission using hand tools in local sand stone or slate. I specialise in making sundials for specific situations and occasions as well as garden sculptures and memorials. I exhibit regularly and am passionate about my work. I also run courses in beginners lettering which usually take place over a weekend at a nearby courtyard garden. These are for a maximum of four people and are great fun as well as being rather therapeutic.